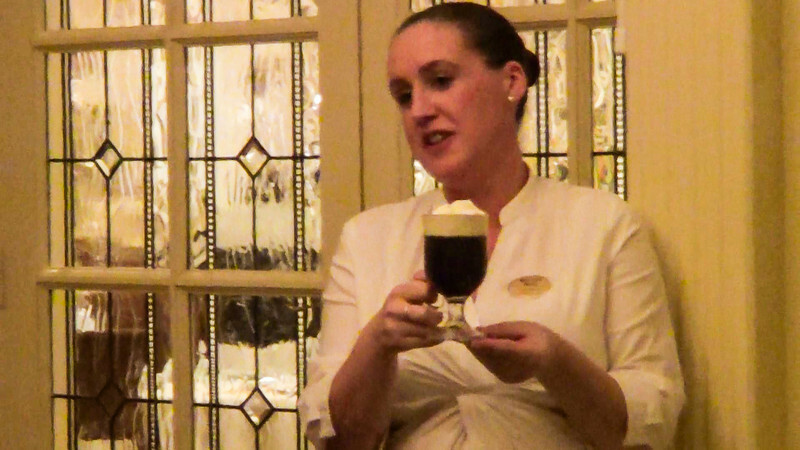 Our delectable dinner at the Granville Hotel in Waterford ended with a lesson in how to make an Irish coffee. But not just any Irish coffee. 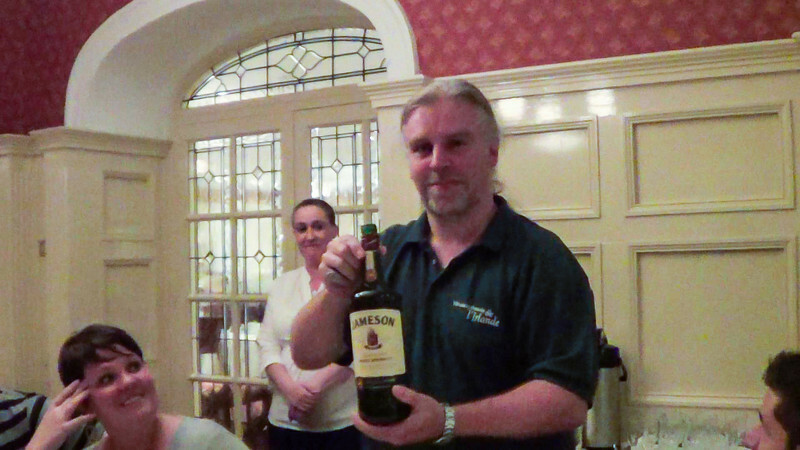 When a hostess arrived to show us an easy way to make it, our tour guide Mick broke out a bottle of Jameson Irish whiskey. You can't make Irish Coffee without it. Legend has it that the original Irish coffee was invented in the 1940s by Joe Sheridan, who worked at an air terminal in County Limerick, western Ireland. On a rainy, blustery winter evening, a small group of American passengers disembarked from a Pan Am Clipper, after having unsuccessfully tried for 10 hours to reach Canada. Sheridan saw how cold, wet and miserable they were. He knew from experience that a cup of coffee just wouldn’t do the job, so he decided to warm the passengers up a bit with a new concoction. When the passengers asked if they were being served Brazilian coffee, Sheridan shook his head and told them it was “Irish coffee”. It was a huge hit. That said, it’s amazing how many Irish bars and restaurants have no clue how to make a good Irish coffee. If you order one and it’s not a beautiful, layered creation, they didn’t make it right. One thing to note about the whiskey: Never let them serve you budget whiskey. If it isn't good enough to drink on its own, it's not going to be any good in the coffee, either. Dan and I are the first ones to tell you that we're not fond of whiskeys, scotches or bourbons. We had never tried Jameson before, and to be honest, we were shocked that we actually liked it. Anyway, this is why I specifically mentioned Jameson Irish Whiskey in this article. It's not a snub to any other Irish distiller, but we only mention companies we have first-hand experience with. Tip: If you work at Bushmills or another distillery, let us know. We'll be happy to visit and then share our experience on this blog. Put a teaspoon into a glass coffee mug (the kind with a stem) and pour some boiling water into it to warm it up. (The spoon is there to reduce the chance that the glass will crack, but be careful!) Swirl the water around and pour it out. Pour the whiskey into the glass. Add coffee up to within an inch from the rim. Serve the coffee on a plate with NO SPOON. Drink the coffee through the layer of cream. Most recipes specify heavy cream, and some say that lightly whipping it helps to keep it afloat. The fresh cream we used at Granville had been whipped so perfectly that we could just plop thick spoons-full on top. The coffees were delicious, but I was so horrified to see them using instant coffee instead of fresh brewed that just I couldn’t bring myself to finish it. Blecch. Gag. Our guide Mitch kindly gave me a hefty dose of Jameson to compensate. Must. Hire. Him. Again. Dan, however, is nowhere near the coffee snob that I am. He had no problem with devouring every drop of his creation. While everyone was making and enjoying the coffee, the conversations turned to variations on the theme. So many bars and restaurants have come up with variations that there are entire web pages devoted to hot alcoholic coffee drinks. Here are a few just for fun. Maybe you can come up with others. Tip: If you are using a sweet liqueur such as Tia Maria, you won’t need to add the sugar. The liqueur will have enough sugar to keep the cream afloat. After you watch this video, continue scrolling down for more on making it yourself. We were at the Granville in Waterford around October 2, 2016. Your post is exactly how they made it. They also handed out cards on making Irish Coffee. I too was taken back with using instant coffee at first. The proof is in the product. Wow! Easy and delicious. The how-to cards are a great idea. I guess they came up with that idea after we had visited. Please let me know if there are restaurants in Nairobi that provide Irish coffee, my whisky brands are Johnnie walker black and Jameson. I’m sorry, we have no idea about restaurants in Nairobi because we’ve never been to Kenya. Perhaps a google search will send you to one that appeals; a good bartender can create anything, especially if you share the recipe in our story with him. Considering the excellent reputation of Kenyan coffee I’m sure you will be pleased with the result.